South Africans Philip Buys and Matthys Beukes (SCOTT Factory Racing) showed impressive climbing ability when they won the Bridge Cape Pioneer Trek’s Queen Stage and moved into the overall lead on Tuesday. 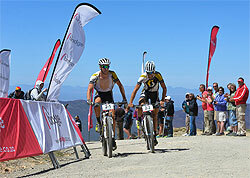 The South Africans were the first to the summit of the Swartberg Pass, the only mountaintop finish in international mountain bike stage racing. The signature stage, which covered 86km and climbed a total of 2781 metres, is also the richest, paying out R125 000 (US$12 500) to the first men and women’s teams to the finish line. South African marathon champion, Robyn de Groot and Swedish marathon champion, Jennie Stenerhag (Biogen Toyota Cape Brewing Co.) were the first women’s team to the summit, extending their overall lead by almost seven minutes over stage runners-up, Briton Catherine Williamson and Belgian Alice Picard (Asrin Cycling). The German-based Team Bulls riders, Tim Bohme and Simon Siegbahn, overall leaders for the first two days, faltered on the final ascent of the Swartberg Pass losing almost four minutes and dropping to second place on the General Classification. The diminutive Spanish duo of Ismail Ventura and Ramon Segues (ESMTB.com) finished second on the stage and maintain their third place overall going into Wednesday’s Stage 3. 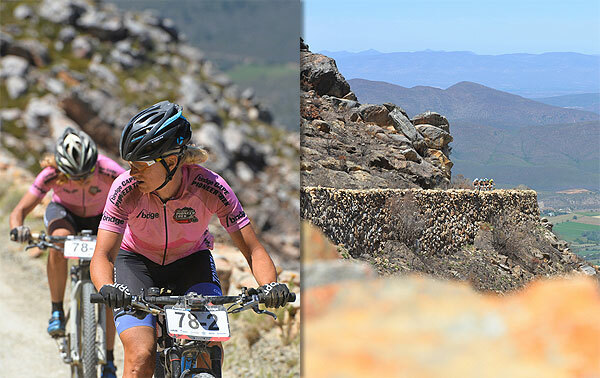 Beukes and Buys chose to race the Cape Pioneer Trek, traditionally considered better suited to dual-suspension bikes, on hardtails (no rear suspension) specifically with Tuesday’s stage in mind. “We usually race our full-suspension SCOTT Sparks, but we decided that since we’re both quite skilled and were hungry for the win on the Swartberg Pass, SCOTT Scale hardtails would be our choice. Clearly the decision paid off,” beamed Beukes. Their hardtails are 1000g lighter than their dual-suspension bikes, which may not seem like much, but is when the final climb has a relatively smooth gravel surface and climbs 1100 meters in 11km. For De Groot and Stenerhag the stage win, by such a large margin, was a surprise. “We decided to race this stage like any other stage and not become distracted by the final climb and the big prize money,” said Stenerhag. “At around half way we noticed the Asrin team was right behind us, so we put in a bigger effort and moved clear of them. We weren’t sure what our lead was over them at the start of the last climb, but someone did shout to us a little later that we were four minutes ahead of them,” explained Stenerhag. “We just focused on finding a good rhythm to hold our lead and were very happy to see that we increased it even,” smiled the Swede. In the other team racing categories, South Africans James Tenant and David Garrett were the top Amateurs, claiming the GC lead in the process, while Germans Max Friedrich and Jana Mischance (Firebike Tomotion by Blacktusk) were the first Mixed team home, also moving into the overall lead in their division. Heinz Zorweg (AUT) and Bartie Bucher (SUI) of Team Meerendal Wheeler 2 were the top Masters once again, extending their category lead significantly, while South Africans Johan Labuschagne and Gerrie Beukes (Klein Karoo Veterans) secured the Veteran men’s stage win and moved into second overall, behind compatriots Fanie Venter and Wayne McDuling (Pynfabriek). In the Solo men’s division, Konny Looser (SUI) won the stage in his category and overall. He gained a lot of respect for his rapid ascent, but he didn’t gain any significant change to his bank balance, as the large cash prizes are only for the first teams to the summit. In the Solo women’s race Christine Janse van Rensburg (RSA), won another stage and extended her overall lead. Wednesday’s Stage 3 is a 107km leg from Prince Albert to De Rust. With a total of 1543m of ascent, it’s expected to be a day of consolidation for many, although teams that haven’t lived up to their early expectations are likely to be in the hunt for a stage win.